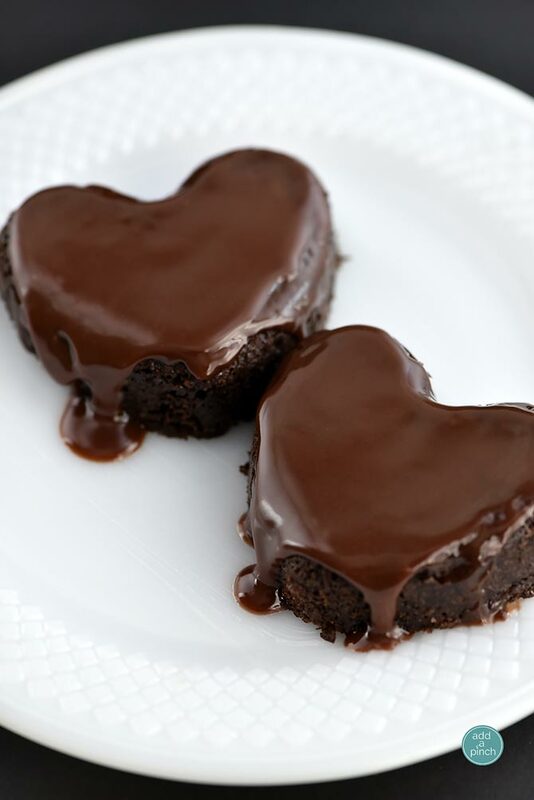 These Chocolate Cake Hearts are perfect for sharing with your sweetheart! A mini heart version of my Best Chocolate Cake Ever, topped with chocolate ganache and served with love! 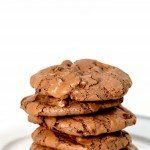 Are you looking for a special dessert to serve for Valentine’s Day this year? I think this one might just be it! Especially if your sweetie loves chocolate! These Chocolate Cake Hearts with Chocolate Ganache are not only perfect for Valentine’s Day, they are so special for parties, showers, anniversaries, Mother’s Day and so many special events! And these are so simple to make – yet they make such an elegant and pretty dessert! I think you are going to love them! 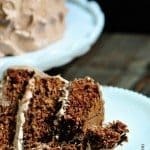 I started by making my favorite chocolate cake recipe, my Best Chocolate Cake Ever, as a sheet cake rather than a layer cake. I’ve actually shared that way of making it with you before, so that part is super simple. While my cake is cooling, I make my Chocolate Ganache using the Ganache Glaze recipe. Then, once the cake has baked and cooled, I take a large heart shaped cutter and cut large hearts out of the cake. I used about a 3-inch cutter for mine. I place the hearts on serving dishes and pour about 1/4 cup of ganache over each. I then repeat with the ganache until it reaches the desired thickness. For Valentine’s Day especially, I love making my Raspberry Sauce to adorn each dessert plate. This makes such a pretty presentation and such a delicious dessert too! Make sure you save the pieces of chocolate cake you have remaining after you cut out your heart shapes. These are so good placed on a skewer and dipped in chocolate ganache! 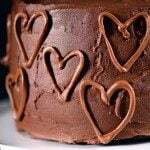 Here’s my recipe for how I made my Chocolate Cake Hearts. I love them and I think you will too! 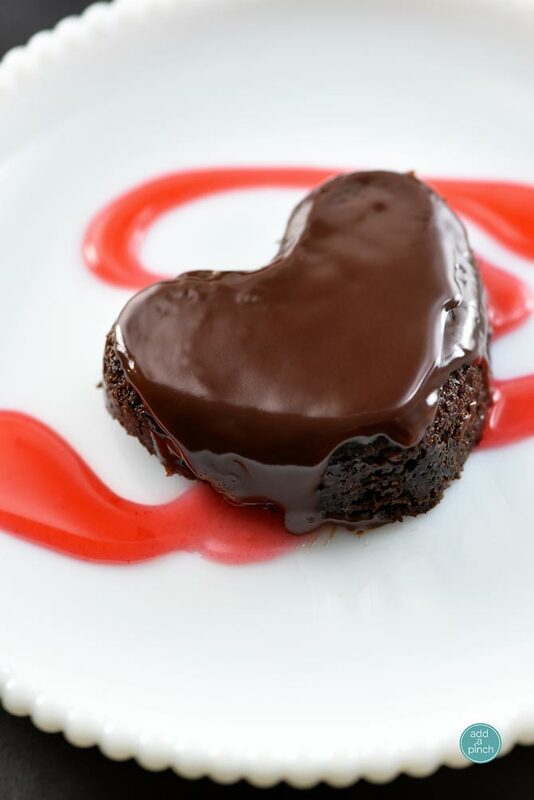 These Chocolate Cake Hearts are perfect for sharing with your sweetheart! 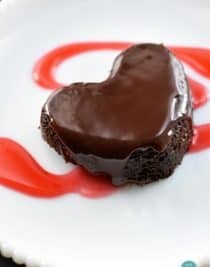 A mini heart version of my Best Chocolate Cake topped with chocolate ganache and served with love! Preheat oven to 350º F. Prepare rimmed kitchen sheet pan with nonstick baking spray or by coating with shortening and dusting lightly with flour, being sure to remove all excess flour. Prepare the chocolate cake batter as directed and pour into rimmed sheet pan. Use an offset spatula to make sure the batter is distributed evenly. Place in the oven and bake for 12-15 minutes or until the cake slightly pulls away from the edges and a toothpick comes out clean when inserted into the center of the cake. Allow the cake to cool slightly, about 10-15 minutes. While cake is cooling, prepare ganache recipe using the ganache glaze recipe. Cut cake with a heart shaped cutter and place on serving dishes. When ready to serve, pour about 1/4 cup of ganache over top of each cake. Repeat with additional ganache until it reaches the desired thickness you prefer. I use a half sheet pan, 12 x 17 inches. From cutting the heart shapes, there will be pieces of cake left over. This is not included in the serving quantity, but is delicious to cut into pieces and serve with long skewers to dip in warm ganache the next day! 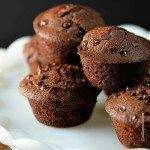 These look so rich and moist and chocolaty! Perfect for Valentine’s Day! These chocolate hearts have totally won my heart! Aww, thanks so much, Jocelyn. Just took your chocolate cake out of the oven. 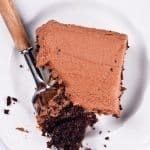 Your cake with chocolate butter cream icing is to die for. Thank you, for the recipes. What size sheet pan Robyn? Wonderful. Cute, chocolate and easy. My kind of dessert. Thanx! Hi Robyn – do you remove the cake from the sheet cooking pan before using the heart-shaped cutters? I assume the baking pan is 9×13??? 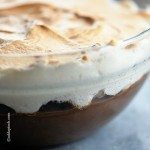 Love your recipes!! This one looks fun to make with my granddaughter too. You will let the cake cool according to the recipe instructions, then use the heart shaped cutter and cut in the sheet pan. Looks wonderful, can you please tell is the size of sheet pan? I baked the batter in my heart shapedmuffin pans. Adorable, and no waste.